Press releases used to be one of the basic tools of the public relations profession, used by PR practitioners to communicate news directly to journalists. With the advent of new online communication channels, the goals, target audiences, and overall scope of press releases have evolved, transforming press releases themselves into a new communication tool used by public relations and marketing professionals alike. Tactics, opportunities and challenges of using online press releases. 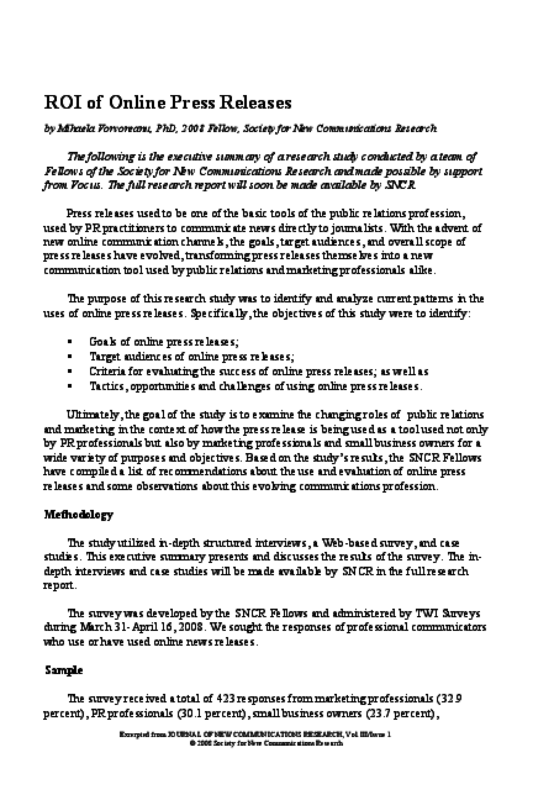 Ultimately, the goal of the study is to examine the changing roles of public relations and marketing in the context of how the press release is being used as a tool used not only by PR professionals but also by marketing professionals and small business owners for a wide variety of purposes and objectives. Based on the study's results, the SNCR Fellows have compiled a list of recommendations about the use and evaluation of online press releases and some observations about this evolving communications profession.